Colorful crafts, artisan shops, and the smell of delicious eateries saturate Olvera Street with Mexican culture, reflecting the cultural diversity of the city's birthplace. A pedestrian path that is completely lined with shops and food stalls, Olvera Street is located in the oldest part of the city of Los Angeles. Olvera Street is a small pedestrian street leading off of the central plaza of the original Pueblo of Los Angeles, founded in 1781. Lined with eateries and shops, it leads from the plaza to Cesar Chavez Avenue and contains many of the oldest buildings in Los Angeles. 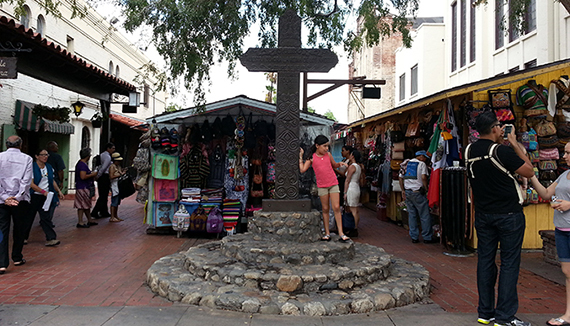 Olvera Street boasts a rich history as a part of the oldest section of Los Angeles. Over the years, the street has become a vibrant microcosm of Hispanic culture. Photo El Pueblo De Los Angeles. Los Angeles was founded under the Spanish flag in 1781. With Mexican independence in 1821, Olvera Street and the adjacent Plaza was the heart of Mexican farming and ranching community life in the area. In 1848, California was ceded to the United States, and by the 1880s the small town of Los Angeles had begun to grow rapidly. As the town expanded, the original settlement became neglected, and served as a neighborhood for Mexican, Italian, and Chinese immigrants. After the street was threatened with demolition, Christine Sterling began a campaign in the 1920s to renovate the historic adobes of the pueblo and remake Olvera Street as part of a revitalized birthplace of the city. In 1930, the street was renovated and reopened as a successful Mexican market street reflecting old Los Angeles. It was an instant success. The City of Los Angeles now operates the Mexican marketplace of Olvera Street and has worked to maintain its architectural and cultural influences over the decades. Olvera Street is a focal point of the El Pueblo de Los Angeles Historic Monument; it is a place where visitors can get a taste of Mexican culture and a sense of the history that still stands preserved in the buildings and plazas that surround the street. Family owned storefronts and cafes have been around for nearly 100 years and are evidence of the deep roots many have on Olvera Street. There is a striking contrast between Olvera's tight quarters in the sprawling context of what has now become of the second largest city in the U.S. Olvera Street continues to be a living monument to the city's history, with a festive atmosphere of celebration that adds to an unmatched and authentic liveliness reflecting the city's birthplace. 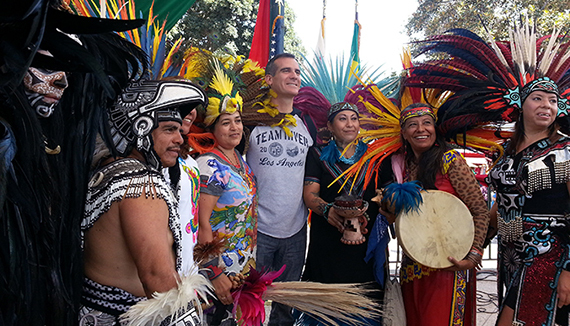 Native dancers on Olvera Street pose with Mayor Eric Garcetti during the City of Los Angeles's 233rd birthday celebration in 2014. Photo El Pueblo De Los Angeles. Olvera Street is a hub of historic significance, with Spanish, Mexican, and American heritage located in the oldest section of Los Angeles. Its colors, smells, and sounds have made it one of the most unique places in LA. The City of Los Angeles has used zoning as a tool to not only preserve the uniqueness of Olvera Street, but also bolster its economic development. As one of the oldest sections of Los Angeles, the street is a major piece of El Pueblo de Los Angeles, and is listed on the National Register of Historic Places. Los Angeles also classifies this area as a historic resource under local zoning and ordinance provisions. The Central City North Community Plan adopted in 2000 specifically addresses Olvera Street and its contiguous neighborhoods, and provides a basis to preserve, enhance, and maintain these historically significant resources. Olvera Street businesses benefited from California's "State Enterprise Zone" designation, as well as ongoing local and state level preservation funding which continues to restore the greater area. Targeted zoning in and around the Olvera Street area helps support small businesses with reduced parking requirements, and allows increased floor area for projects outside of the Pueblo that adhere to specified development standards. The adjacent Union Station Master Plan work will continue to improve pedestrian connections between Olvera Street and the key transit hub of the greater Los Angeles area. The Blessing of the Animals at Olvera Street that takes place the Saturday before Easter Sunday is a tradition dating back to 1930. This all-day event includes street performers and a parade of pets that are blessed by religious leaders. Dia de los Muertos, the Day of the Dead, is a colorful Mexican ceremony that brings ornate altars, exhibits, and entertainment to Olvera Street in remembrance of loved ones who have died. The Cinco de Mayo celebration on Olvera Street is a popular and traditional celebration of Mexico's victory over French forces, with live music, food, and drink during this May 5 celebration. 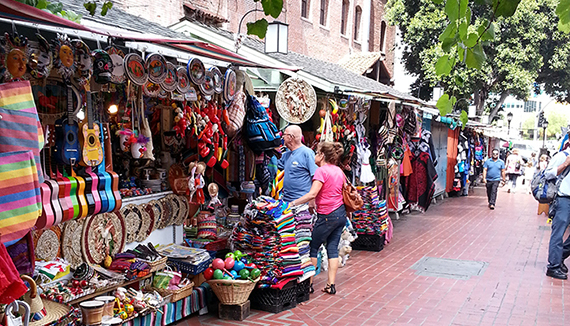 Visitors and shopkeepers on a typical day along Olvera Street. The site is popular with locals and tourists alike. Photo El Pueblo De Los Angeles. Los Angeles's Union Station is directly east of Olvera Street, and has become the hub of the city's Metro Rail system. Implementation of the Union Station Master Plan will link the revitalized transit hub directly to Olvera Street and the Plaza.